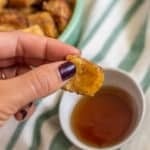 These gluten-free French toast bites are an easy and delicious breakfast that is perfect anytime but especially on Christmas morning. Be sure to shake the extra egg and cream mixture off before coating in cinnamon sugar. Pro Tip: Be sure to start with eggs that aren’t too cold as well. I like to let them sit out for just 10 minutes or so before I start. If you want to make this dish more festive, use eggnog instead of cream or milk. You can also get creative with gluten-free extracts like coconut, almond and orange. Just be sure not to add too much. One teaspoon should do it. However you choose to serve them, they are sure to be a hit! Pro Tip: You can fry the cubes in oil but butter is much tastier! I recommend using real butter. Kerrygold is my favorite brand but Irish roll butter is robust as well.